All year long, M-22 has so much to offer! Spring, Summer, Winter, Fall: M-22 has it all. The snow melts, the ground thaws and the days grow longer: Spring is here. As flowers start popping up, bikes and golf clubs are dusted off. Boots change to walking shoes. A perfect beach day sneaks in between two chilly days. 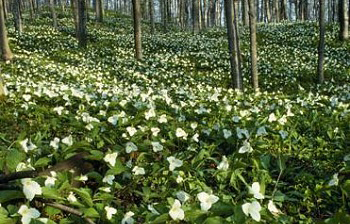 In Michigan, spring is signified by the coming of the trilliums. The common, beautiful white flowers blanket the forest all over Northwest Michigan. There are several other species of trilliums in Michigan ranging from pink, red, green or yellow flowers as well as different shaped leaves. Some of these species are threatened or endangered and protected under the State Endangered Species Act. Morel mushroom hunting is a popular spring activity for many people in Northwest Michigan. Early spring brings people out into the woods, searching for a mushroom that resembles a wrinkly gray honeycomb. This mushroom likes wet, 50°F weather and prefers certain trees more than others. Do your research and ask around for tips, though most people are unlikely to reveal their favorite hunting spots. Morels are delicious and a classic spring flavor here in Michigan; fry them up with a steak, throw them in an omelet, or sautee them up on the side. 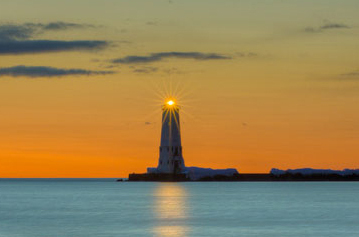 The most popular time for vacationers to visit Northern Michigan, summertime is filled warm weather, sunny days and lots of time spent enjoying the outdoors. There are an abundant amount of things to do. Go swimming in the lake, hiking in the Sleeping Bear Dunes, kayak down the river, camp in the forest, or grill out with the family. Most towns have there major festivals and events during the summer, like Traverse City’s the Cherry Festival and Film Festival. You will find live music in every town along M-22 during the summer as well as Arts and Crafts fairs throughout the summer. Farmers Markets usually run from May-September. Read more about all the summer Farmers Markets along M-22 here. Arguably the best time to travel M-22, fall is the time of year that brings the best and brightest colors to the leaves of the trees. Peak time is mid to late October, though it can change from year to year. Take a leisurely drive along M-22 and immerse yourself in the reds, oranges and yellows. There are so many apple orchards throughout Northern Michigan, and they are a great place to stop and take in the fall air. Drink apple cider, have fresh doughnut, pick apples right off the tree and get lost in a corn maze. Orchards offer lots of fun activites and delicious things to eat. 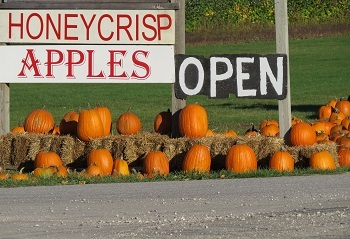 Apples, squash, pumpkins and fall produce of every kind are also available at many Northwest Michigan Farmers Markets. 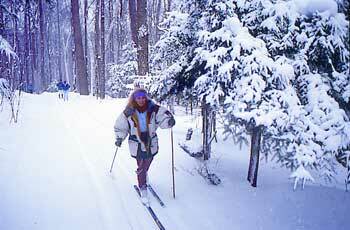 Not for the faint of heart, a Northern Michigan winter offers many adventures. Go skiing, snowshoeing, sledding, ice fishing — and, of course, end the day curling up with a hot chocolate in front of the fireplace. Most rivers still run during the winter, creative picturesque scenery that draws photographers from all over. Sleeping bear dunes is sculpted daily with added winds and snow. Even during the winter, many towns celebrate the snowy wonderland with different festivals and events. Christmas is a magical in the snow covered, quaint towns along M-22. The Victorian Sleighbell Parade in Manistee is a December classic. In February, travel the Leelanau Peninsula Wine Tour for Taste the Passion and visit Glen Lake’s Winterfest for a delicious chili cook off. No matter where you are, you’ll find spirited people and fun adventures even in the dead of winter.